Thinking about something simple but tasty? Shrimp with broccoli is the one! It can be simply served on top of white rice, or as part of a multi-course meal with friends and families. The key is to keep each ingredient as fresh as possible so that the color is original and vibrant. I used large-sized shrimps since they tend to shrink a bit after cooking. If you like any other vegetables, please feel free to add them in. That’s the beauty of stir-fry:) Just simply boil all in a pot with a few drops of oil, which helps maintain the color of ingredients. Oyster sauce is a must have for this recipe. You can get it from any Chinese or Korean grocery store, or even online. Now let’s start cooking! 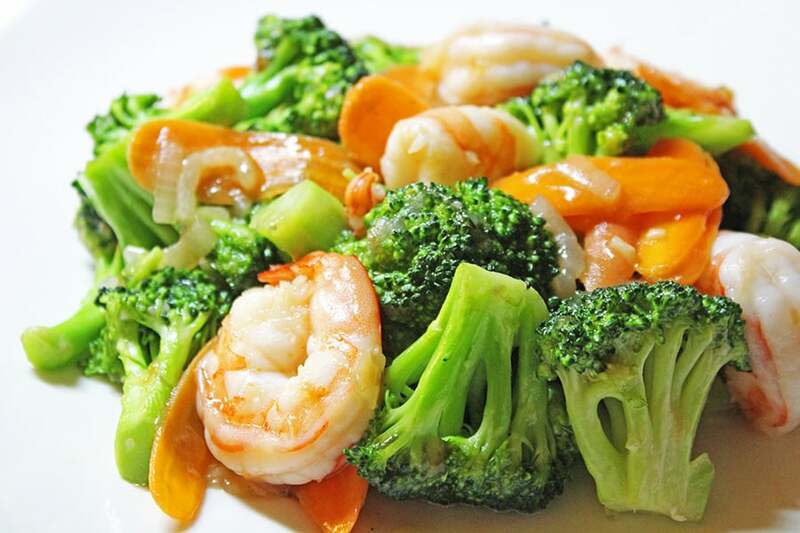 A healthy Chinese dish that combines veggies and shrimp in a light sauce. Marinate shrimp with dash of white pepper, 1 teaspoon cornstarch and 1/4 teaspoon sesame oil. Cover and refrigerate for half an hour. Boil a pot of water. Add a few drops of oil. Blanch the broccoli florets in boiling water about 2 minutes. Transfer the broccoli to cold water. Drain and set aside. Prepare the sauce: in a small bowl, mix 1 tablespoon water, 1 tablespoon cornstarch and 1 tablespoon oyster sauce. Stir well and set aside. Heat 1 tablespoon oil in a skillet over medium-high heat. Stir fry shrimp for 2 minutes, or until color changes. Transfer to a plate. Wash the skillet and then heat the remainng 1 tablespoon oil over high heat. Add garlic and onion. Stir fry for 1 minute. Add shrimp, broccoli and sauce. Stir fry for 1 minute. Add 1/8 teaspoon salt. Transfer to a plate and ready to serve!